The 10th book in Chrissy's mysteries is out. If L.A. psychologist, Christina McMullen, knew Lieutenant Jack Rivera planned to propose marriage, perhaps she wouldn’t have attacked him with a lobster pick. Had she realized the true reason for the attack on her receptionist, maybe she wouldn’t have awakened with a mysterious hottie lying next to her in bed. And maybe, just maybe, she’ll figure out who’s trying to kill that hottie in time to save him, her endangered client, and her own tempestuous relationship with the irresistible Lieutenant Rivera. 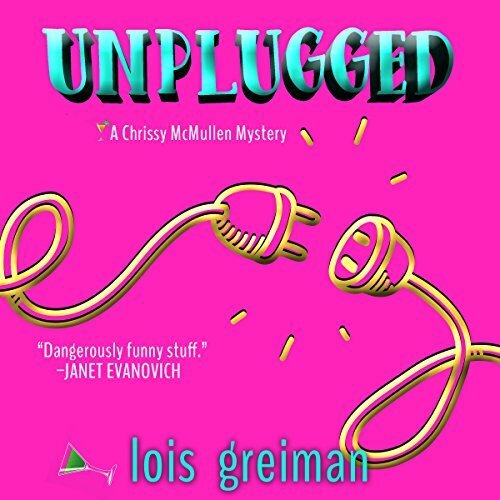 UNPLUGGED now AVAILABLE in AUDIOBOOK through Audible! UNZIPPED also available as on Audible. Chrissy's second mystery can now be heard for free with a subscription on Audible, or can be purchased separately. Please, click here to order. Hello readers, and welcome to my home page. I'm so glad you've dropped in. Since you're here, I assume you love fiction as much as I do. I can't wait to share some with you. If you like characters that are a bit off center and stories that will make you laugh or cry, or possibly a little of both at the same time, I think you'll enjoy my novels. Please feel free to keep in touch with me through Facebook. I do a little giveaway most Thursdays as a way of saying thanks to all of you who have been such loyal readers. So as always, read voraciously; reality is overrated. "Just what the doctor ordered." **Not every recent book can be advertised on my homepage. Be sure to check out my List of Titles for more.